A monsoon scare is the last thing an already jittery corporate India needs. And that's exactly what it got in June. As the country got 31 per cent less rain than normal till 2 July this year, Agriculture Minister Sharad Pawar stepped in and assured that the situation was not critical and he expected sufficient rain in July and August. However, the India Meteorological Department , or IMD, said monsoon this year would be 96 per cent of its long-term average, lower than the April forecast of 99 per cent. FROM THE MAGAZINE:Is India still a monsoon economy? A normal monsoon means rainfall between 96 per cent and 104 per cent of the 50-year average of 89 centimetres during June-September. A good monsoon can definitely leave a lot of cash in the hands of the rural consumer and boost sales, particularly of SUVs and passenger cars. "Rainfall over the country as a whole for the 2012 southwest monsoon season is likely to be normal," the IMD said in a statement. Akshay Gupta, managing director and chief executive officer, Peerless Fund Management, says, "Although the season has begun on a weak note, any improvement over the coming few weeks will cheer the markets. Sectors related to agriculture such as fertilisers, tractors and those dependent on rural income like fast moving consumer goods, or FMCG, will be direct beneficiaries." Dipak Acharya, fund manager, equity, Baroda Pioneer AMC, seconds Gupta. "Normal to good monsoon is good for automobile, FMCG, interest rate-sensitive industries and agriculture-related companies." A good monsoon is beneficial for companies that make fertilisers, a crucial farm input. During the quarter ended March 2012, fertiliser maker Zuari Global posted a net loss of Rs 4.37 crore (down 120 per cent) as against a profit of Rs 21.42 crore in the corresponding quarter a year ago. Other listed companies Deepak Fertilisers and Petrochemical Corporation, Fertilisers and Chemical Travancore and Khaitan Chemicals and Fertilizers posted net profits of Rs 45.48 crore (down 13.73 per cent), Rs 38.24 (down 241 per cent) and Rs 2.35 crore (down 16 per cent), respectively. DK Aggarwal, chairman and managing director, SMC Investments and Advisors, says, "During the quarter ended March 2012, the industry faced pressure on margins due to high commodity prices. In the second quarter of 2012-13, the sector will benefit from the fall in crude oil prices and higher demand on the back of normal monsoon." Around 20 fertiliser-related stocks trade on stock exchanges. Market experts are positive on some of these. "Rashtriya Chemicals and Fertilizers, National Fertilizers and Gujarat State Fertilizers and Chemicals may be considered if the monsoon is favourable," says Aggarwal. According to a research report by Prabhudas Lilladher issued in June, one can bet on Chambal Fertilisers and Chemicals. It set a one-year target price of Rs 83. On 29 June, the stock was trading at Rs 73.15. ALSO READ: Should you invest in agricultural commodities? Urea is the most widely used fertiliser in the country. According to market experts, India produces 22 million tonnes urea as against the demand for 28-29 million tones. The Fertiliser Association of India says the gap will widen to 11 million tonnes by 2016-17. According to data for the last seven years, 2009-10 was bad with average rainfall 22 per cent below the long-term average. In 2007-08, it was 6 per cent above the long-term average while in rest of the years it was 1-2 per cent above or below the long-term average. 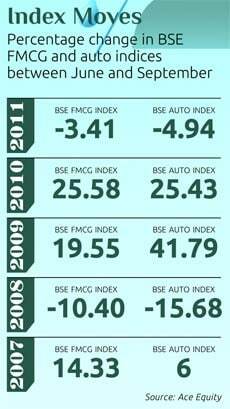 Rain and fortunes of the FMCG sector and closely related. The impact of poor rain in 2009-10 was visible on Hindustan Unilever (HUL) sales, which fell 13 per cent. In 2007-08, rainfall was 6 per cent above average. That year, HUL's sales rose 17.6 per cent. Similarly, normal rainfall helped HUL grow sales by 12.1 per cent in 2011-12. HUL has a 20 per cent weight in the BSE FMCG index. Other FMCG companies in the index registered 6 per cent growth in net sales in 2009-10. In 2007-08 and 2011-12, the figures were 15 per cent and 16.3 per cent, respectively. Sunil Jain, head equity research, retail, Nirmal Bang Securities, says, "Normal monsoon can improve the purchasing power of rural India and help FMCG companies increase sales faster. If we see the performance of top ten FMCG companies in India, aggregate sales grew 20 per cent in 2011-12. Margins, too, improved. If we get a reasonably good monsoon this year, too, we may see similar growth." According to market experts, stocks such as HUL, ITC, Marico and Vimal Oils are better placed to take advantage of a favourable monsoon. Till 29 June, HUL, ITC, Marico and Vimal Oil and Foods stocks have risen 13 per cent, 31 per cent, 53 per cent, 27 per cent and 14 per cent to Rs 454, Rs 259, Rs 573, Rs 184 and Rs 69, respectively. According to a report from Edelweiss Institutional Equities, HUL and ITC can touch Rs 490 and Rs 275, respectively, in the next few quarters. Prakash Diwan, chief portfolio strategist, Prakash Diwans Wealth Circle, says, "If the monsoon is favourable, Vimal Oil and Foods and Marico stocks can rise 12-15 per cent in the next six months." The sector is facing slowdown due to the high sales base of last year. June sales of most auto makers disappointed. Sales fell 2.3 per cent in June compared to May. Diwan is positive on auto stocks if the monsoon is good and the festival season demand is reasonable. "A good monsoon can leave a lot of surplus cash in the hands of the rural consumer and boost sales, particularly in sport utility vehicle and passenger car segments. I expect robust double-digit growth to continue for some of the leading companies in the sector." Arun Agarwal, auto analyst, Kotak Securities, seconds Diwan. "The demand for tractors, two-wheelers and passenger cars comes from rural areas. Good monsoons play a critical role." Deven Choksey, managing director, KR Choksey Securities, says, "The investor can select stocks such as Maruti Suzuki and Mahindra and Mahindra and expect 15 per cent return in six months." 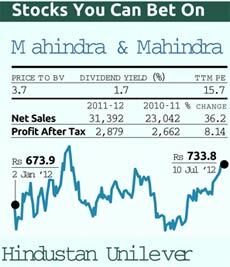 On 2 July, Maruti Suzuki and Mahindra and Mahindra were trading at Rs 1,180 and Rs 714, respectively. Let us pray for a good monsoon. It will surely bring a lot of cheer! Right time to invest in agri-commodities?